d'hommes pour jetons et le monde entier pour tapis. Outside the Super U grocery store I returned the supermarket caddie* to the "caddieshack" (I guess you could call it)--that covered storage area where all of the grocery carts are empilé, or crammed into one another. In France you have to rent shopping carts. To release a metal cart, you insert a one euro coin into the horizontal slot on the caddie's handlebar. Lacking a one euro coin, you can use a jeton* provided by most supermarkets. Organized shoppers have the nifty jetons hanging from their keyrings. I am not one of those people, but someone who tends to lose jetons, so it was no surprise that the last time I entered the supermarket with a "J'ai besoin d'un jeton"* request the manager flashed a "Not vous again!" look. Back at le parking,* after having unloaded all of my courses* into the trunk, I was gathering up momentum to push the caddie into a line of carts when a young woman approached me, smiled and held out a one euro coin. "Non," I said pointing to the coin slot, "Il y a un jeton dedans." When she stood there smiling and pushing the euro coin toward me, I realized she hadn't understood. After repeating "No, there is a token in there!" it was déjà vu all over again, with the woman standing there grinning and offering me the same two-toned coin. I am used to shoppers offering a coin at the caddieshack entrance, saving you the trouble of reinstalling the carte, wrestling the coin from the caddie, only for them to insert a coin and wrestle the caddy back out. But this time I had inserted a jeton instead of real money. The thought of the kind lady discovering the fake coin at the end of her shopping errand horrified me. Or almost.... It did cross my mind to accept her one euro coin. In each of us lives "un petit diable," n'est-ce pas? But I didn't succumb to monsieur le diable, not this time at least. Chercher la confirmation de son moi dans les yeux d'autrui revient à se regarder dans les miroirs déformants d'une fête foraine. sans blague? = really? you're kidding? "Well, isn't it still vacation?" Max countered. *References: sans blague = you're kidding? On doit continuer à chercher pour trouver. Quand le soleil se perd dans la nuit, l'espoir guette un reflet. "C'est un fouinard! * He is a snoop! He will go through all of your things." His mouth was painted deep strawberry, his cheeks bright pink, and his eyes were now set off with glittery blue powder... Some people snoop and get caught red-handed, while others fouinent* and get caught red-lipped. At a busy intersection near St. Tropez a woman runs up to the Peugeot 307 two cars behind us, shakes sudsy water from a plastic Evian bottle onto the windshield and lunges forward to wipe the glass with one of those hand-held rubber-bladed window wipers. When the car's occupants remain motionless, the woman gives an exaggerated shrug before advancing to the quatre-quatre* just behind us. The driver automatically reacts by activating the car's windshield wipers. A clever way to ward off unwanted washer services! It is a sweltering day on the Côte d'Azur,* and I sympathize with the women who are trying to make ends meet via this suds-slinging enterprise--that is, until I glance into the rearview mirror and see the woman heading toward our just washed car. Heureusement,* we didn't have to wag glossy fingernails or flip on the essuie-glace* to escape the deluge. It was the feu vert* that saved us. Don't miss the story that originally appeared here--now a chapter in this book! one foot while making a whip-like movement with the opposite leg. I was not prepared for the effect that the death of Julia Child would have on me. Casually enough, I began reading the adieus* to the French food ambassadrice* in various online newspapers. What inspires me most about Julia Child is that she didn't seem to find her way (or as the French say, "trouver sa voie") until relatively late--in career-life years anyway. It wasn't until she was 37 years old that she enrolled in the famous Cordon Bleu cooking school in Paris. She did not compromise her beliefs to please others, or as my husband said, "Elle a gardé son âme" (she kept her soul). She was not swayed by trends such as nouvelle cuisine or low-fat recipes and, perhaps most importantly, she remained her own goofy, awkward, intelligent, graceful, warbly-voiced-self while successfully demystifying the art of French cooking. As I sit at my kitchen table putting together a quiche, Julia is on my mind. I am reminded to not be so impatient when assembling the ingredients. Indeed, Julia encouraged us to enjoy the process. I crack four brown-shelled eggs and whip them with une fourchette* (I do not yet own the fouet* that Julia made famous in the U.S.). Realizing the kids have snatched my kitchen scissors, I borrow a pair of shears from the bathroom. As I clip mint from our garden directly into the bowl of fork-whipped eggs, I marvel at how hair shears are an ideal, if accidental, herb cutting tool. Scissors in hand I reach for a slice of leftover jambon de parme* and clip that up as well. It probably looks odd to clip meat with hair shears (or to clip meat for that matter), but as Julia reportedly used to say, "Remember, you are alone in the kitchen and nobody can see you." I add roasted pine nuts and fresh goat's cheese to the mix and stir the sloppy soup before pouring it into a store-bought unrolled pastry shell (a buttery "pâte feuilletée" to be exact). Though the instructions tell me to leave the quiche to cook for 30 minutes, I set the timer for twenty "just in case" and miraculously remember to check the tarte* 18 minutes later, only to find its surface charbroiled. I do not sigh, but whisk the quiche out of the oven and place it on the table, offering an enthusiastic "Bon appétit!" I imagine Julia would have done the same. 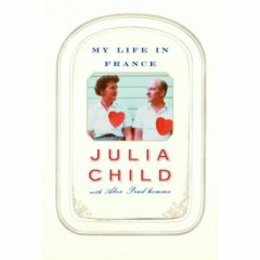 In books: My Life in France is "the captivating story of Julia Child’s years in France, where she fell in love with French food and found ‘her true calling.’ " --from the publisher.